A computer provides a great resource for learning new things and keeping in touch with family and friends, but it may seem intimidating at first. The bestselling Computers For Seniors For Dummies is here to help the 50+ set conquer and overcome any uncertainty with clear-cut, easy-to-understand guidance on how to confidently navigate your computer and the Windows 10 operating system. Featuring large text and images, it's never been easier for seniors to smoothly click their way around a new PC. 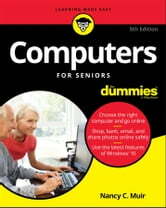 If you've just purchased your first computer and need a plain-English introduction to getting started, Computers For Seniors For Dummies has you covered.